The 16ohms PDI06L16 Power Attenuator from Palmer can be used is live applications and allows for stage distortion of tube aplifiers while reducing the associated high volume level. 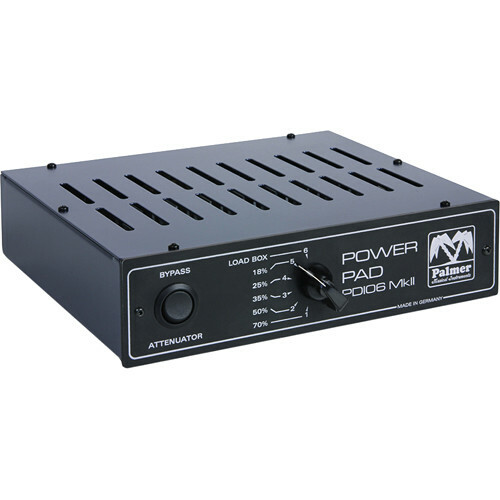 The device is connected between the amplifier output and the speaker cabinet and permits practical volume reduction in six increments from 100% to 18%. A mute setting silences the speaker, allowing the device to function as a load box and absorb the entire output power of the amplifier. The PDI06L16 features an input for the speaker signal from the amplifier and outputs for connecting to a speaker cabinet. PDI06L16 Power Attenuator (16 ohms) is rated 4.0 out of 5 by 1. Rated 4 out of 5 by Anonymous from Very transparent and well made. The Palmer PDI06L16 attinuator is a very transparent tool for reducing SPL in amps lacking a master volume. The construction is very solid. It also features a load box for DI recording. At present I have not had the opportunity to test the sound of the loadbox in my studio. It will not turn a 100watt amp into a bedroom amp as some might hope, but it will reduce a 50 or 100 watt amp to a good volume for band rehersals while not coloring the amps tone. My only thought (not a complaint) after putting it thru it's paces with a brutally loud 1976 50w premaster Marshall is that 1 more step of volume reduction would be helpful. Aside from this I am very happy with my purchace.